Back in the days of Austria′s Baroque boom period, high-ranking nobility that proved loyalty to the Habsburgs in the wars against the Turkish Empire, in the counter-reformation or with the suppression of Slavonic or Magyar ethnicities could earn themselves significant fortunes within a fairly short amount of time. Several families took over the possessions of Protestants, revolutionary Bohemians or newly conquered Turkish territories. However, nobody acquired as much as the legendary "liberator of Vienna", Prince Eugene of Savoy. Towards the end of the Turkish Wars, his fortune rivalled the one of the Habsburgs. Conveniently, Prince Eugene was gay and therefore, died with no heir - so his many castles, book and art collections and other possessions went back into the pool after his death in 1736. Two (or actually three) of his castles were in Vienna: His Palais in the first district now serves as the ministry of finance and has one of the most famous Baroque entrance halls in Austria, designed by Fischer von Erlach. The other two are the twin buildings of the Belvedere: The Upper Belvedere and the smaller, yet more personal Lower Belvedere, connected by one of the country′s finest Baroque gardens. The two castles house the "Österreichische Galerie" or "Austrian Gallery", which aims to give an account of all art that is Austrian from around the Middle Ages to Baroque art and "proper Austrian" art (after the formal foundation of the Austrian Empire in 1804) with Biedermeier, Impressionism, Realism, Expressionism and modern styles. To the international visitor keen on sightseeing, it is most famous for housing the World′s largest Klimt collection and therefore, supplements the Schiele collection of the Leopold Museum very well. 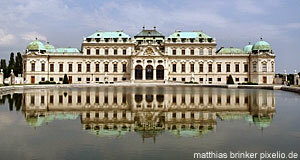 In Austria, however, the Belvedere has become a national icon in 1955. It was on the balcony of the Upper Belvedere that Chancellor Leopold Figl presented the signed "Staatsvertrag" treaty to the cheering crowds, announcing independence for Austria after the occupation through allied forces that followed WWII. The reason why I like the Belvedere (it is among my favourite museums in Vienna) is partly because of the appealing architecture and the impressive collection, but partly also because I like how the exhibition is arranged around the "theme" of Austria. Typically for a Viennese museum, it does not claim to be complete, but constrains its collection to works created by Austrian artists, artists in Austria or to artworks that are useful to demonstrate a foreign influence on Austrian art (for example a moderately exciting Munch to illustrate the development of expressionism). However, before we dive into the gallery, let′s have a look at the palace itself first. The design was done by one of the two most famous architects of Austrian Baroque: Johann Lukas von Hildebrandt (1668 to 1745) - the other being Johann Bernhard Fischer von Erlach. The Lower Belvedere served as something like a welcome-spot for arriving guests and its central element is the Marble Hall, where the guests could marvel at the wealth and glory of Prince Eugene. Attached to it is an Orangery, following proper Baroque conventions. To be a good nobleman in Baroque days, you got to breed decent oranges.